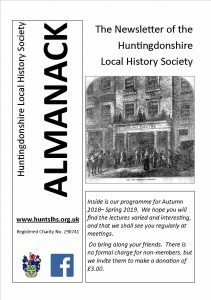 Twice a year, in the Spring and Autumn quarters the Society publishes the Almanack, which is a newsletter giving the Society’s planned activities over the forthcoming six months. In the winter months there are programmes of lecturers, meetings and events and during the summer months excursions to places of historical interest, both local and further afield. These activities will be transcribed into the Future Events calendar for members and non members to view. To download a copy of the latest Almanack, click on the picture to the left. The Chairman will email copies to all members who have registered their email address with the Society. Where members prefer printed copies these will be posted to them or printed copies will be available to be collected at the monthly meetings and lectures. The Almanack is also available as a pdf document that can be downloaded and printed. To download your copy of the current Almanack click on the picture of the Almanack above. You can book your place on any of the planned excursions by downloading the Booking Form and sending it to David Smith before the listed booking dates.